Episode 31: "The Man in the Wall"
During the demolition of the bombed-out, abandoned remains of the Torrance Mansion in the Mayfair section of London in order to make way for a new apartment project, a suit of armor containing skeletal remains is discovered. Mr. Packer, the developer of the proposed Packer Towers Apartments calls on Charlie Chan to help as he is concerned that this morbid discovery, if publicized, will negatively affect his ability to rent the apartments in the future. Hoping to avoid publicity and suggesting that the skeleton is probably over 500 years old, Mr. Packer is against Chan involving Inspector Duff and the police, but Chan, seeking facts, does so as they currently hold the armor and skeleton. A phone call to Duff reveals that the deceased was the victim of a gunshot to the chest, indicating a crime of more recent vintage. Visiting Inspector Duff at Scotland Yard, Chan learns that it was a modern large caliber bullet, perhaps a .45, that killed the unknown victim. Duff notes that the Torrance Mansion was 150 years old and was damaged during an air raid during the war. It seems that on the night of the air raid, Anthony Torrance, dressed in a suit of armor, was holding a fancy masquerade party. He was last seen alive in his study. Chan, expressing doubt as to the true identity of the skeletal remains, but Duff explains that dental records have verified the remains to be those of Torrance. Many guests were killed during the bombing during the air raid. However, Mrs. Torrance survived as did her son, Gerald, then a young child, as well as Virginia Torrance, also a child at the time and now Gerald’s wife. Duff states that a list of all surviving guest from that fateful night is being prepared, adding, "Frankly, I don't think that either Scotland Yard or Charlie Chan has much chance with a seventeen-year-old murder where the scene of the crime has been blasted into oblivion and all the witnesses are dead." Chan expresses his desire to take up this seemingly impossible challenge. Visiting the Torrance residence, the detective speaks with Gerald who wants no part of the investigation, questioning the reason to dig up the past. Chan learns that Anthony Torrance's investment business partner, Christopher Morgan was at the party and was among the survivors. He had had an agreement with the elder Torrance that should one of the business partners ever die that the other partner would take sole possession of the company, which is what indeed happened. Gerald is angered at Chan's suggestion that Mr. Morgan may have had a motive to kill his father. Mrs. Torrance enters the room and expresses her new sadness to learn how her late husband actually died. As Chan leaves, Mrs. Torrance shows a sudden concern about this recent turn of events and is comforted by her son who tells her not to worry. Downstairs, as Virginia is about to speak with the detective, Gerald interrupts, sending his wife upstairs to see his mother. Back at their residence, as Chan and son, Barry, who has constructed a model of the interior of the Torrance Mansion, discuss the facts of the old crime. Virginia Torrance arrives and tries to persuade the detective to drop his investigation. As she leaves, she asks Chan to "leave things as they are, for everyone's sake – including yours." Chan suggests that he and Barry return to the scene of the crime, stating, "Perhaps rubble which concealed skeleton in armor can also reveal skeleton in closet." At the site of the rubble that was once the Torrance Mansion, while Chan and Barry consider the many out of the 200 guests who perished on that fateful night, Mrs. Anthony Torrance arrives. She, too, to Chan's great surprise, implores the detective to halt his investigation, even offering money to do so. After Mrs. Torrance leaves, Chan is nearly struck by a large piece of falling rubble. A car is then heard speeding away. Later, Chan visits the office of Christopher Morgan who also expresses his displeasure toward the investigation. Morgan's recollections of the evening of the bombing are clouded and lack much information, but states that he had been playing billiards at the moment the bomb struck. He also affirms the possibility of Torrance having any enemies due to the very nature of the investment business. When asked if he had or owned a .45 caliber at the time of the murder, Morgan brushes it aside with a flat denial. Back at their residence, Chan and Barry, using Barry’s model, seek to place all potential suspects at the time of the bombing. Barry notes that the billiard room was located next to the study where Mr. Torrance was last seen. Upon reading the lengthy list of victims who perished at the mansion on the night of the bombing, Chan halts at one in particular, that of Police Inspector Robert H. Ferguson of Scotland Yard. Chan wonders why a Scotland Yard police inspector would be at an elite masquerade party, certainly not as an invited guest. Chan suggests that he is still lacking a key component of the mystery and suggests a visit to Inspector Duff. At Scotland Yard, a test has just shown that it was probably the bullet from a German .50 caliber machine gun, probably fired from a dive bomber, which actually killed Mr. Torrance. Chan then asks Duff about Inspector Ferguson's presence at the party. Duff explains that the Inspector was present as a part of an investigation involving Anthony Torrance and his partner Christopher Morgan possibly being involved in a black marketing of British currency across to America during wartime. With Ferguson's death, the inquiry had ended as he had left no records of his work on the case. Chan reveals that he has learned from Morgan's butler that Morgan did possess a .45 caliber gun. It was possible that the Inspector could have been murdered, in order to silence the investigation, before the bomb hit the mansion, he suggests. Mr. Packer visits the Chan residence seeking Charlie Chan. His father being away, Barry speaks with the developer. He, too, now wishes for the investigation to stop, having received a threat from the Torrance family stating that they will bring a halt to the development project unless the investigation is ended. Facing financial ruin, Packer insists that the elder Chan drop the case as the Torrances will stop at nothing to stop the investigation. Hearing that, Barry realizes that his father is at the Torrance home as they speak, and he rushes off. Currently, Chan is meeting with the three members of the Torrance family. He states that the investigation is now directed toward the murder of Inspector Ferguson and adds that Mrs. Torrance, Gerald, and Virginia are each aware of the identity of the murderer. He continues, stating that both Gerald and Virginia witnessed as children the murder of the Inspector. At this, Gerald pulls a gun from a nearby drawer, stating that he will not have his father's name smeared by the newspapers. Suddenly, his mother lunges for the gun which Chan takes from her grasp. As Barry bursts in and Inspector Duff steps into the room, Virginia admits that she and Gerald had witnessed the murder, something that they have had to conceal since then. Mr. Torrance had killed Inspector Ferguson just before the bullet from the German dive bomber ended his own life. The bomb blast had, indeed, removed all evidence of that crime. Chan then requests that Duff forget the threat that Gerald had made against him, but, based "on regulations," takes him into custody. Chan assures Mrs. Torrance that Gerald was only seeking to save his father's image and that he will soon be back with his family. With the truth now finally revealed, the Torrance family has nothing more to fear. Chan leaves for Scotland Yard to help Gerald by not pressing charges. Inspector Duff (to Charlie Chan): "Mrs. Anthony Torrance is still alive, though; she lives in Brook Street." Brook Street - One of the principal streets in the exclusive central London district of Mayfair. Inspector Duff (to Charlie Chan): "You know, Charlie, the Nazis had over 500 planes over London that night; the alert lasted five hours." The London Blitz - Between September 7, 1940 and May 21, 1941 there were major German air raids on 16 British cities. Over a period of 267 days, London was attacked 71 times. Starting on September 7, 1940, London was bombed by the Luftwaffe for 57 consecutive nights, causing massive destruction and loss of life. Always most necessary to learn facts before fiction – sometimes fly might be in ointment. Can retire detective but old Oriental brain always interested in unusual. Most unusual for ancient knight to be shot by a bullet. I have never been in favor of rapidly jumping to conclusions. Old Oriental detective loves challenge of the impossible. In crime there is no age. In crime, detective not only has right, but it is his duty to investigate every possibility. Ancient Chinese saying: "Man in iron suit no good for dancing – cannot get feet off ground." Many years as detective have reputation never to abandon case until all problems are solved. As a rule, only murderer would like to have secret kept. As a rule, the world looks unfavorably upon murder. Not every day does man survive a bombing. Imagination not much help in art of detection. Never jump to hasty conclusions – sometimes person falls flat on face. Truth cures many things. Is very possible truth could also cure all ills of the world. 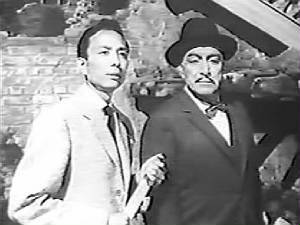 Charlie Chan most indestructible Chinese – hardly ever gets killed.